Easy Commute, Good Connectivity – Our Top List of Optimally Located Wedding Venues in Mumbai That’ll Leave No Excuses for your Guests to Not Show Up! Have you commenced the major hunt for the perfect wedding venue yet? While considering various options, are you looking at the how convenient will it be for your guests to make it to your wedding? Good thinking, unless you’re subtly trying to wean out a chunk of them and deliberately making it impossible for them to attend your wedding. A great hack to shorten that guest list, aye! What is the first thing you check out when you receive a wedding invite? Besides the who’s marrying who information, it’s quite natural that you will find your automatically scanning the card to search for the wedding venue information. Where is the shaadi and how easy is it to get to it? Once you find that on the invite, your mind rushes through directions and options on how fast and conveniently can you reach the location. Isn’t it? If you were living in Panvel, attending a wedding town side is no easy feat. Am I right, or am I right? So, here we are again, with our super-secret, well researched, handpicked list of optimally located wedding venues in Mumbai that will make it effortless for your guests to attend your special day. So no more excuses like “I was stuck on traffic for three hours and had to turn back,” should be accepted. Conveniently located at the corporate hub of Navi Mumbai, Four Points by Sheraton meets the need of today’s discerning bridal couples. Hosting a lavish wedding on your mind? This hotel has got you covered with its thoughtfully designed 15, 000 sq. ft. indoor and outdoor event space. Their banqueting facility is fully-equipped with the latest audio-visual technology, while their expert events team ensure your big day is a smooth run. Another convenient find in Vashi, Imperial Banquets is more than just ideal to host a luxurious wedding celebration. Located at Raghuleela Mall in Vashi, their large banquet hall can be divided into two to suit your varying configurations. From food to décor, this venue has your back for all your wedding festivities. Couples these days like to keep their weeding as close and intimate as possible. If you’re that kind too, then let The Park be your ultimate choice to host your wedding festivities. In addition to being an optimal location in Navi Mumbai, The Park offers a feel of sheer elegance when it comes to food, décor and service. 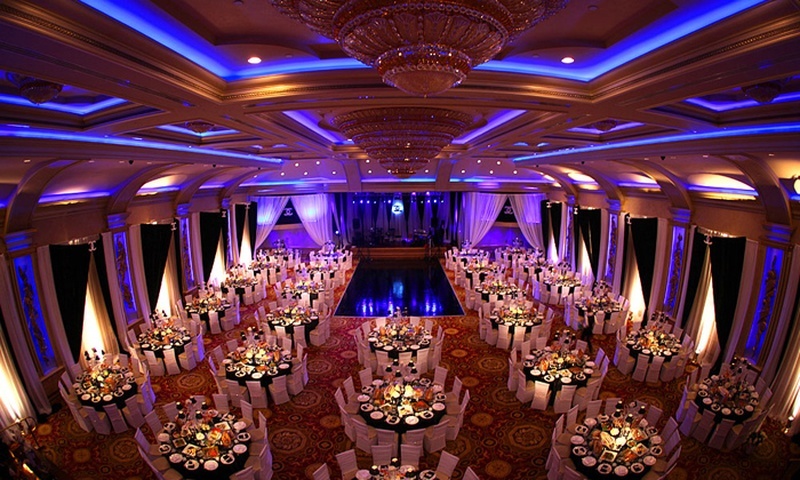 This 5 star wedding venue will leave no stone unturned to transform your special day into a grand celebration. For a wedding on a budget, Dreams Banquet is sheer bliss. Whether it’s a small and tiny or big and fat celebration you intend to have, this wedding venue easily fit your wedding budget. Their in-house decorators and DJ set the right mood and enhance your celebration, while their culinary experts serve the most delicious food options. You simply can’t go wrong with this one. When a budget wedding venue is optimally located on Mumbai’s central line, you cannot ask for more. CKP Hall offers the best wedding venue one could wish for that is gorgeously decorated by their in-house decorators as per your requirements. Their expert caterers too put up a personalised menu that perfectly suits your taste buds and is well appreciated by your guests. Optimally located at Grant Road, Krishna Palace is a swanky South Mumbai hotel that offers tastefully designed indoor and outdoor options. We bet locking down just one venue would be even more difficult than choosing what to wear for your wedding. With varying capacity options there’s one to suit your pre wedding and reception requirements. Are outstation guests attending your wedding? Impress them with a venue that will give them a preview of what a wonderful city Mumbai is. Optimally located near Churchgate station, 20 Downtown offers 3600 sq. ft. of event space at your disposal. Their impeccably designed banquet facility seamlessly decorated by their in-house decorators is sure to leave your guests spell bound. Well-known for conducting all kinds of gala events and wedding festivities with excellence, Grand Celebrations offers a fully-air-conditioned banquet hall that can be customised to suit any and every kind of celebration. Other than being an optimally located wedding venue in Mumbai, Grand celebration is an all-in-one location that can arrange not just food and décor, but also undertake guest management. Centrally located to the rest of the city, Holiday Inn is that last yet not the least favourite pick when it comes to choosing an optimally located wedding venue in Mumbai. This International hotel brand needs no introduction. The name itself speaks volume of its excellent service. Choose either of their indoor or outdoor wedding venues, none will fail to impress.